It's my second week back at uni and I'm getting back into the routine of things. I thought I would do something a little differnet and do a 'what's in my bag: uni edition' post. Of course, this applicable for any stage of study and just a few things that I class as essentials. At school I always wanted to have the coolest pencil case and now that I have grown up, not much has changed! To be quite honest, my course doesn't require me to do much writing, so for the most part, I only really need a writing pen. But I like to have the options there. So I picked up a small pencil case from Monki (available at ASOS) that would fit a few essentials like: A coloured pen, highlighter, ruler, pencil, ruler and a rubber. That sounds like a lot but I got a thin pen style highighter and a mini rubber so that it would fit neatly into my pencil case. It's super handy to have, even if you don't study so that your pens don't get the lining of your bag dirty. This year I have been really dedicated to staying organised and having a diary has been my biggest help! I put everything in here, from gym classes to assignment deadlines. It's an easy way to keep track of all the things you've got going on and if you're as forgetful as Dory, like me, you'll find you can't go anywhere without a diary. My diary (which is now on sale!) 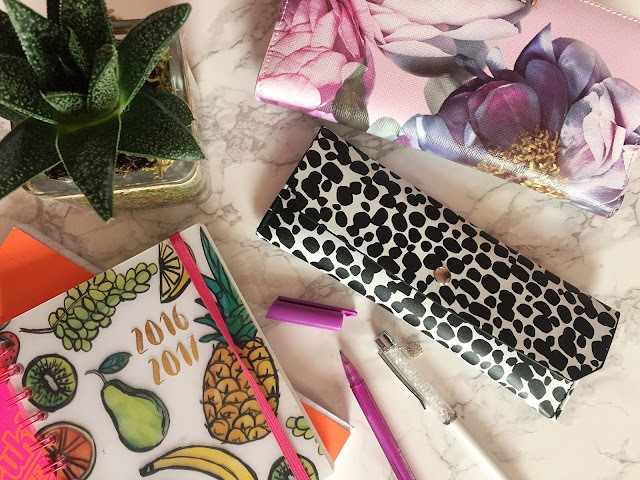 is an academic one from Paperchase and I adore the design of it - it's so tropical and refreshing! Paperchase do an amazing selection of diaries and they're really good quality too! Even though note-taking, doesn't really seem to be a big deal at uni, I always like to have a notebook at hand in case I need to write down anything important. I've always been loyal to the Pukka pads as the quality of the paper is so good and the notebooks are always really sturdy. I've gone through many pukka pads over my studies and I always buy from their range! A few other essentials include: my glasses, water, a portable phone charge, a USB in case you're doing any work on the local computers and can't email it over to your private account and of course me beloved Ted Baker purse that was gifted to me for my birthday by my Boyfriend. Swear by Pukka Pads, the more the better!